For those of you who don't know, I am doing my Dietetic internship this school year through BYU. I am doing different rotations at different hospitals and clinics until May when I can take the Registered Dietitian exam and be a real Dietitian. So far I have really really enjoyed it. For the first couple of months I managed a little cafe on campus where I ordered all of the food and helped with developing recipes. For the past couple of weeks, I have started my clinical rotation at Utah Valley hospital. It has been really cool, and makes me excited to be able to work in a hospital when I am done with my internship. The most exciting thing of my internship was my trip to Chicago a couple of weeks ago with my Dietetics buddies. It was the American Dietetic Association's annual conference and expo. BYU paid for us to spend a few days in Chicago, and although I missed Dan a ton, I had lots of fun with my girlfriends. We went to the conference during the day where we learned lots in classes and got tons of free food and random junk from the expo! There were so many free granola bars and food samples, we fed some of the homeless people in Chicago with our samples while we walked down the streets! By the end of the conference, we knew what stands had the best samples, and who gave away the neatest pens, vitamins, and teaching tools! Needless to say, we only ate out for dinner, which included Chicago style pizza and hotdogs. We went on a boat tour through the city to see all of the neat architecture. We stayed right across the street from Grant Park (where Obama gave his acceptance speech) There is the really neat reflective bean as well as other kind of weird pieces of "art" in the park that we took pictures at. We also went to a Natural History museum and did some shopping on the magnificent mile. It was freezing cold in Chicago and super, super windy. I was glad to come home to 70 degree weather in Utah, and Dan of course! How fun! Looks like you had a blast and ate some good food! Is Chicago style pizza really all it's cracked up to be? Chicago it definetly on my list of places to visit...someday! Good to chat with you for a minute today! Hope your stew and rolls turned out yummy! Katie 2 blogs in 1 week! I am so impressed. I really have absolutely no room to talk. It looks like you had lots of fun. Katie that trip looks so fun, aren't you guys supposed to be eating healthy food though! Just kidding, I miss you I can't wait to see you soon at Christmas, I am glad you updated! 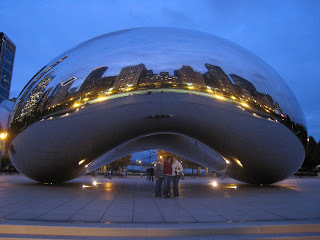 I took pictures at that bean thing too! How cool is that? Oh I love Chicago! Your blog is cute! I am glad you are enjoying your internship so much, I bet that trip was super fun with those girls. Anyway, hope you are doing well, we need to get together soon. You need to tell me when you update your blog. I had no idea what I've been missing out on for the past 13 days! Chicago looks fun and we can't wait to have you and Dan home. Whoa dang, I had no idea you had a blog! Glad I stumbled onto it, although the Chicago pics are making more jealous :( Hopefully something will work out for my group!